Exciting news to report!! 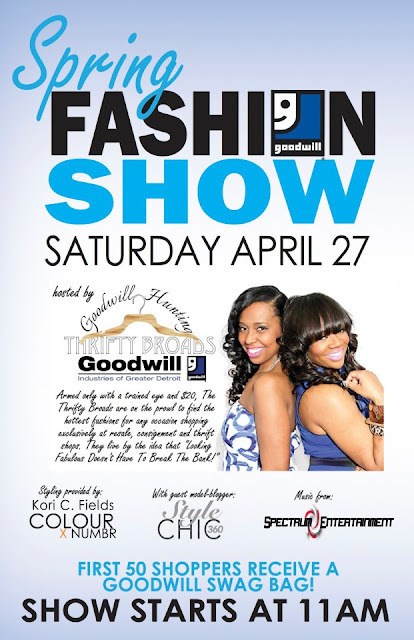 I'm partnering with Goodwill Industries of Greater Detroit﻿ and my sisters in Thrift the Thrifty Broads﻿!! Together, along with 18 other models, both children and adults, we'll walk the runway and showcase the hottest fashions, styles and trends in the Goodwill Industries Spring Fashion Show! No Thrift360 or ThriftyBroads event is complete without style, shopping and fun!! Goodwill Industries has deep roots in the "City of Detroit" and is a phenomenal organization that directly benefits our community. So Turn Up and Let's Thrift it Out!